The Nova Star ferry begins its summer schedule June 1. Nova Scotians are upset that Maine has not helped to subsidize the service. The state did allocate $640,000 to improve the Ocean Gateway Terminal. 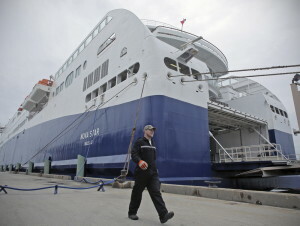 The Nova Star ferry begins its summer schedule on June 1. Nova Scotians are upset that Maine has not helped to subsidize the service. The state did allocate $640,000 to improve the Ocean Gateway Terminal.